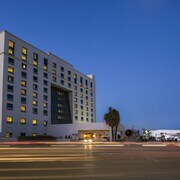 My husband and i went to juarez and stayed here at City express junior right across from the US consulate. 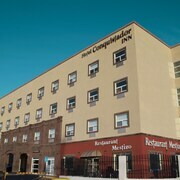 The room was perfect for us and the staff are friendly and always kept the room clean. Made a good choice in hotel. The experience was nice I just wish they had more English channels other than the news but hotel was clean everyone was friendly and helpful and best of all no bed bugs!! Just one little issue! Breakfest was terrible! and could use some fruit other than just oranges! 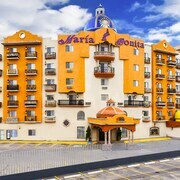 We love this place and always stay here when we come to Juarez. Travel is one of the best experiences money can buy, but you don't have to empty your bank account to do it. If you're on your way to Ciudad Juarez, continue reading for some inspiration! It's situated 960 miles northwest of the national capital, Mexico City, and 12 miles southeast of Sunland Park. With so many things to see and do in this part of Chihuahua, it's easy to understand why 1,500,000 locals reside here. Dig out your camera and spend an hour or two taking photos of Juarez Market and the Benito Juarez Monument. Craving a few moments of quiet meditation to take a break from the tiring pace of vacation sightseeing? Swing by Cathedral of Our Lady of Guadalupe! If you were hoping to tour its sacred grounds, check its opening hours ahead of time just to be safe. If you're going to visit Chamizal National Memorial, Central Park, the Chihuahuan Desert Gardens and Chamizal Federal Public Park, it's well worth pulling out your smartphone and learning some interesting facts about the flora there. Don't lose sleep over scouring the web for the cheapest prices on accommodations, flights and exceptional experiences. CheapTickets has got you covered, and we certainly haven't made compromises on comfort or convenience. Some might think traveling on a budget limits your options, but with us it's the absolute opposite. With 500 airline partners and around 500,000 properties across the globe, you'll have a world of choice. And when you combine your bookings on hotels and flights, you could save up to $481. Let your inner penny-pincher breathe a sigh of relief with the CheapTickets Price Guarantee. It works like this — if within 48 hours you come across your vacation deal at a cheaper rate, we will match it and reimburse the difference. How's that for penny pinching! Would you like to save on your next CheapTickets hotel? With our rewards program, it's easy! All you have to do is book your flights with us and you'll be rewarded with cash savings. You're only a couple of steps away from collecting savings on eligible flights! Just sign up for free or log into your account, join our CheapCash rewards program, and you'll also be the first to hear about upcoming bonus offers and perks! Hey there, cheapster. Here's a suggestion that will make your adventure not only reasonably priced, but a lot more comfortable. Instead of having to drag your luggage on and off buses or trains during your Ciudad Juarez stay, why not climb behind the wheel of a rental car? There'll be lots of room inside for all your bags, and it'll be easy on your hip-pocket too! Rent a vehicle from Payless at Abraham Gonzalez International Airport and you can go from the plane to the freeway in moments. If you're staying near the city, go to Avis at Abraham Gonzalez Intl Apo. It is situated a short 2 miles from the heart of town. 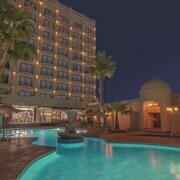 CheapTickets presently features 30 hotels in Ciudad Juarez. 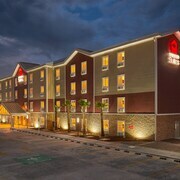 Book soon for dirt-cheap deals! 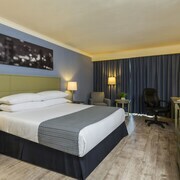 Have a look at the fabulous amenities at the Holiday Inn Express Hotel & Suites Cd. 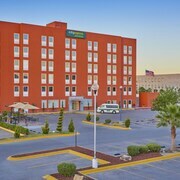 Juarez - Las Misiones and Hampton Inn Ciudad Juarez.